Fairytale Brownies began in 1992 by David Kravetz and Eileen Spitalny who were childhood friends. They made the brownies in a small catering kitchen and used David mom’s 50 year old secret brownie recipe. 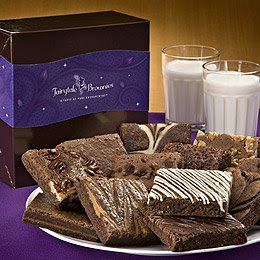 They were a hit as they grew to bake over 2.5 million brownies annually. Now that’s a lot of chocolate! Yum! Fairytale Brownies bake everything from scratch using only the finest, high quality ingredients including imported Callebaut Belgian dark chocolate, premium grade AA butter and farm fresh eggs. Their brownies are all baked by hand and certified kosher. They have a great selection and something for every chocolate lover out there. There are 13 brownie flavours to choose from- Caramel, Chocolate Chip, Cream Cheese, Espresso Nib, Mint Chocolate, Original, Peanut Butter, Pecan, Raspberry Swirl, Toffee Crunch, Walnut, White Chocolate, and Chocolate Chunk Blondie. Are you salivating at the mouth yet? I know I am! I LOOOOOOVE chocolate! 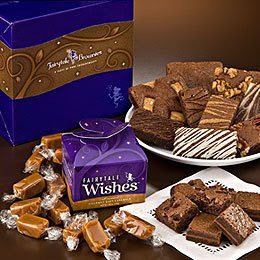 They have such a wide array of products like the Fairytale Dozen which is the dozen assorted brownies or the Fairytale Truffles. If you check out their catalog you will see exactly what I mean about the diverse selection available. 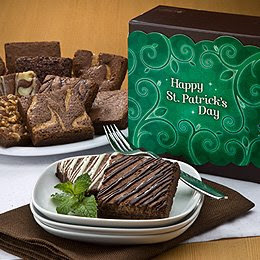 They also have products for Special Occasions like Birthdays, Easter or St. Patrick’s Day. I would love to receive the Fairytale Dozen as a gift for my birthday (hint hint- to my hubby if you are reading this!). I had the opportunity to review the Fairytale Dozenand the Fairytale Truffles- thank you to Fairytale Brownies! The Fairytale Dozencontains 12 premium Belgian chocolate brownies in 12 different delicious flavours. They came in a pretty box and were all individually wrapped and labelled to tell me what each kind was. I also was really impressed with the generous size of the brownies. One brownie will definitely fill you up and they are not at all stingy in their portions either. Let me tell you to bite into one of these brownies is an experience. They are soooooo good!! They tasted really fresh and I loved trying out all the flavours. My favourites were Peanut Butter Brownie and Caramel and I savoured every bite. They were a hit with my girls too. The cost of the Fairytale Dozenis $33.95 and you do get what you pay for- high quality chocolaty goodness and large portions. I would buy them again either for myself as a treat or as a gift for someone. I was also sent the Fairytale Truffles which is one of their newest products. Its a snack size brownie made of Belgian dark chocolate and comes in 3 different flavours- Caramel, Raspberry Swirl and Walnut. They also came in a beautiful box wrapped in an elegant purple bow. The Fairytale Truffles were snack size so smaller than the brownies but just as good. They tasted rich and sweet and satisfied my sweet tooth. 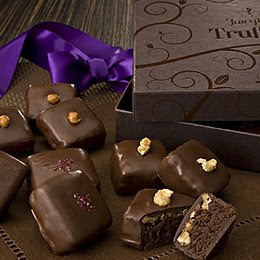 Each box contains 9 truffles and the price is $24.95. I am very impressed with the taste of both the Fairytale Dozenand the Fairytale Truffles and I highly recommend Fairytale Brownies. What a satisfying experience it was! They also offer worldwide shipping so you can try them no matter where you live. I live in Ontario, Canada and couldn’t get over how fast they arrived. Please check out their site for more info on the other products! Big thanks to Fairytale Brownies for the opportunity!